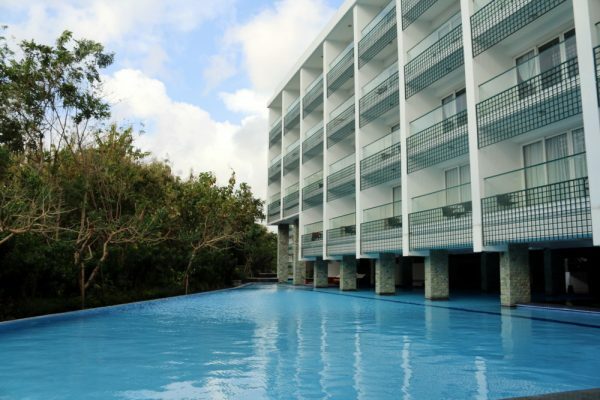 The stylish five-star Sintesa Jimbaran Bali is conveniently located just 10 km from the Ngurah Rai International Airport (Denpasar) which makes this hotel perfect for families and business travellers. 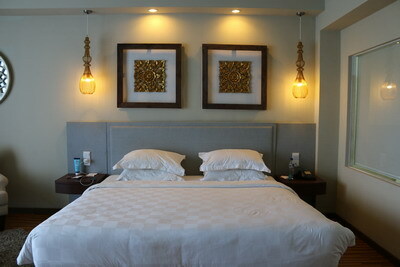 The hotel consists of 206 rooms, suites and apartments and caters for all budgets. The hotel sits on top of the scenic Jimbaran Cliff which showcases breath taking 180 degree views over the bay. 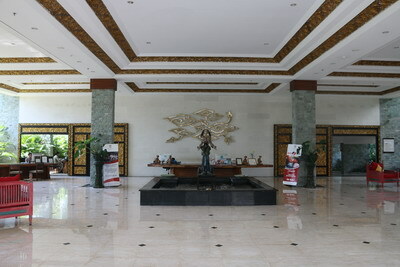 The hotel is located just a short shuttle ride to the beach, bars, cafes and restaurants in Jimbaran Bay and Uluwatu. We were lucky enough to experience a Junior Suite Room which was 56sqm in size and was designed with a modern Balinese style. Coffee/espresso-maker with caffeinated and decaffeinated coffee pods. The Sintesa Hotel has a beautiful swimming pool that runs through the hotel and provides the perfect setting for a laid back afternoon with a few cocktails. The Hotel also has a Movie Room that specialises in independent films, foreign, documentaries, art house and genre films, and many latest releases. 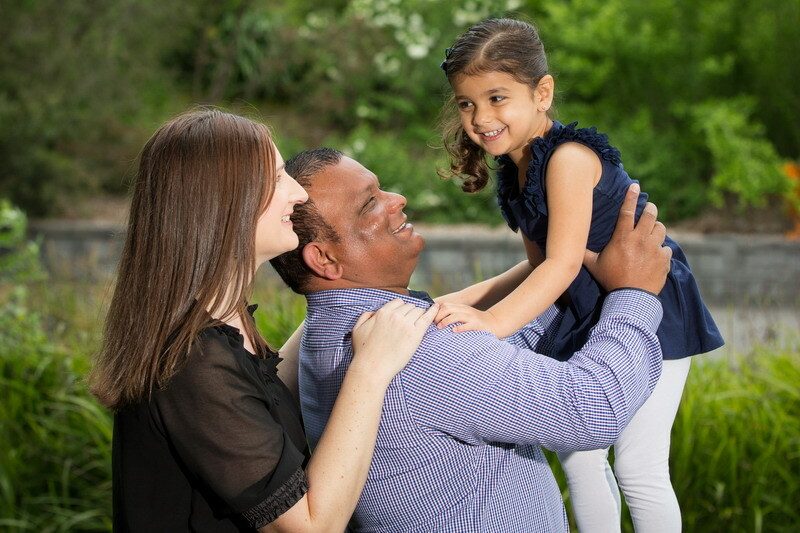 To book a session, please contact reception. 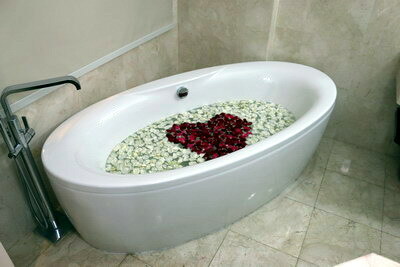 If you’re looking for some time out to relax, then head down to the Wellness Spa and book in for some pampering. The spa offers traditional Balinese massage, release and rejuvenates massage, deep tissue massage, oriental foot reflexology, and spa packages. The Wellness Spa boasts; luxurious treatment rooms, each with heated spa beds, private steam showers, soaking baths and relaxation lounges. 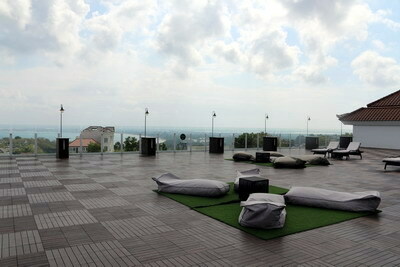 Rooftop on 7 is located on the 7th floor of the Sintesa Jimbaran and has breathtaking views overlooking Jimbaran Bay. Sit back, unwind, take in the magical sunsets and listen to some cool beats while enjoying a colourful Balinese cocktail. 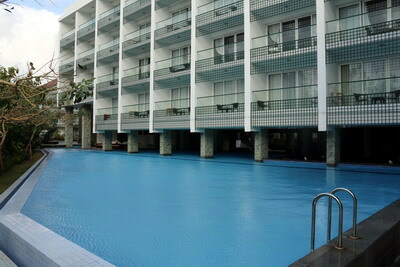 Relax and unwind with your favorites drinks next to the main pool. Sunken Lounge serves light snacks and a wide selection of champagne, wines, cocktails, mocktails, soft drinks and coffees. 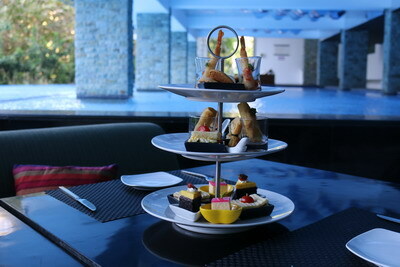 We had a fantastic afternoon tea served here and really enjoyed the food and location. Are you looking for a unique experience? Then if you are, head down to the BARber which is a bar and barbershop experience in one. It features nine seats at the centre piece bar and 90 seats situated around the space. The BARber is an in-house Speakeasy Bar concept facade as a fully functional classic 1930’s themed Men’s Barbershop at the front and a cleverly hidden entrance within to reveal a full-serviced bar. It’s decorated with lush wooden panels and furnished with cozy sofas, a pool table and vintage photographs covering the walls. The BARBer is an artisan’s workshop, constantly seeking quality to serve its guests a unique dining and liquor experience. With live music from local bands on Monday and Wednesday evenings, the BARber is the place to be. We experienced all our breakfast meals at BARber and thought it was amazing. Breakfast is served until later in the day, so if you have had a big night out or just wanted a longer lay in, you don’t have to rush down for breakfast before it finishes. That’s usually us 10 minutes before breakfast finishes, so this was great for us. The buffet breakfast includes eggs cooked to your liking, waffles and crepes, traditional Balinese sweets, breads and pastries and a healthy spread of local yoghurts and dairy products and fruits. 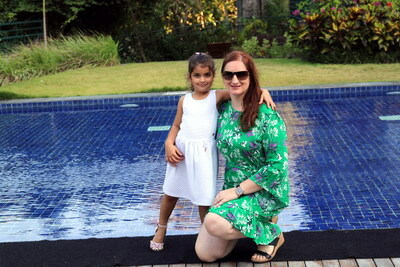 We always love a good kids club and with our daughter who is now 5 years old, she is starting to enjoy these kind of clubs a lot more. 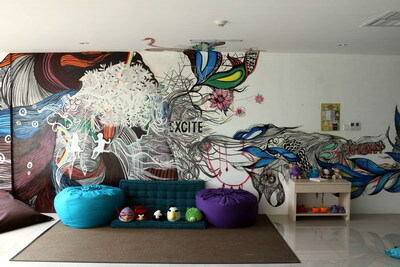 The Kids Creative Room is a private activity zone dedicated to the enjoyment of our younger guests. 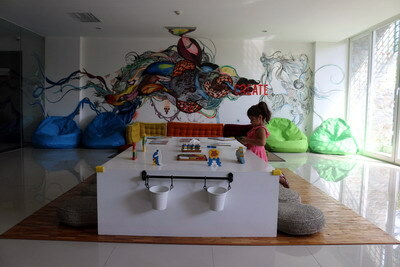 The kids club hosts painting, arts and crafts, Lego building and a broad selection of toys. 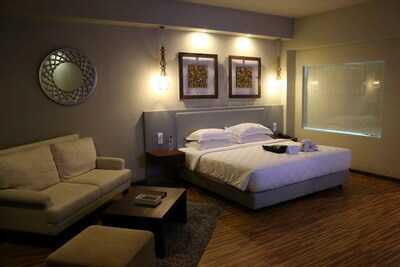 The room is open daily from 9.00am to 8.00pm. 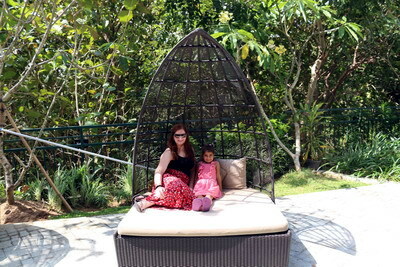 We had a wonderful time at The Sintesa Hotel and thought the staff were amazing and very attentive. We would highly recommend this property to any of our viewers and hope one day you get to experience a great time like we did. 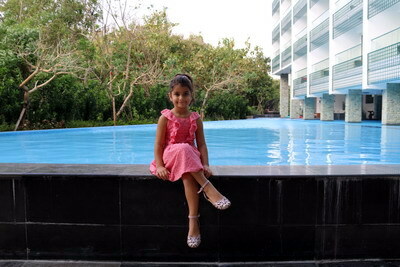 Thank you to The Sintesa Hotel for giving us a memorable experience. We would like to thank The Sintesa Hotel for hosting our stay and as always, we would never recommend a service or product that we didn’t honestly enjoy.